With there not being a chance of getting a pool outside for months, we have been enjoying water play inside, in other ways. Water has such a wonderful, calming affect on Rose in particular. She is 2 1/2 and often struggles with temper and sensory overload. Water provides a break for her. She can focus on the feeling of water running through her fingers, play with the effects water has on objects and enjoy listening to the sounds made by moving water. The conversations that come from water play are great! Here she is organsing her ‘ducks in a row’ and talking to them. 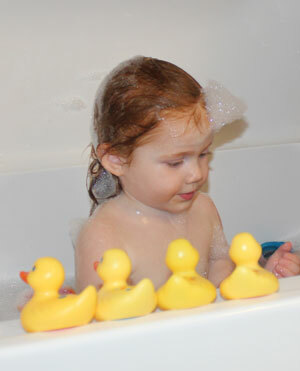 Counting the dots on the duck’s back helps her remember number order and associate oral numbers with physical counts. The number figure on the bottom is more useful for Daisy who is currently working on number formation. Investiate what objects float and sink? Sort objects in water by colour, shape, size, weight etc. Whatever you are doing at the water centre have fun and enjoy the conversations!